A total of 34 European players were in action during NBA’s ten-game night on Wednesday. The Denver Nuggets needed overtime for their seventh consecutive win, 124-118 over the Orlando Magic at the Amway Center. Juan Hernangomez helped the new Western Conference leaders with 14 points, Nikola Jokic notched 12 points, 13 assists and eight rebounds. On the other side, Evan Fournier got to 26 points before fouling out, Nikola Vucevic got a 24-point, 15-rebound double-double and Timofey Mozgov (right knee) remained out. Jonas Valanciunas scored 18 points in the final quarter and posted a season-high 26 points in the Toronto Raptors 113-102 win against the Philadelphia 76ers. Serge Ibaka added 18 points and OG Anunoby had four for the Eastern Conference and NBA leaders. Furkan Kormaz played but didn’t get on the board for the Sixers who suffered their 13th straight loss in Canada. The Memphis Grizzlies beat the Los Angeles Clippers 96-86 despite Marc Gasol’s four points with 1/13 from the field. Omri Casspi scored seven points and Joakim Noah debuted with four. Boban Marjanovic poured 19 points in just 13 minutes for the Clippers, Danilo Gallinari had 17 points, Marcin Gortat two and Milos Teodosic didn’t play. Nikola Mirotic (illness) missed his second consecutive game, but the New Orleans Pelicans’ physical play got them a 132-106 win against the Dallas Mavericks. Luka Doncic started at point guard with Dennis Smith Jr. (right wrist) out, played through a left arm contusion and was limited to a NBA-low eight points. Maxi Kleber notched five points and Dirk Nowitzki (left ankle) remained out. Giannis Antetokounmpo tied his season-low with 15 points but the Milwaukee Bucks overcame the Detroit Pistons with a 115-92 home victory. Ersan Ilyasova (concussion) was on the Bucks’ injury list. The visitors’ Zaza Pachulia notched eight points and Jose Calderon was also in action but failed to score. Tomas Satoransky had 14 points including a clutch three-pointer in the fourth quarter and seven assists in the Washington Wizards’ 131-117 away win against the Atlanta Hawks. His teammate Ian Mahinmi didn’t get on the court. Hawks’ Tyler Dorsey went off for 11 points and Alex Len didn’t score in ten minutes. The Minnesota Timberwolves overcame a 19-point deficit for a 121-104 victory over the Charlotte Hornets. Dario Saric helped out with eight points and seven rebounds. Nicolas Batum had 18 points, eight assists and seven rebounds for the losing side, Willy Hernangomez added four points and Tony Parker didn’t score. Paul George went off for 47 points including 25 in the last period in the Oklahoma City Thunder’s away victory against the Brooklyn Nets. Dennis Schroder aided his team overcome a 23-point disadvantage with 12 points, Alex Abrines didn’t get on the board and Timothe Luwawu-Cabarrot didn’t play. Stephen Curry scored 42 points with nine threes in the Golden State Warriors’ 129-105 away win over the Cleveland Cavaliers. Jonas Jerebko added 11 points. Cedi Osman poured 16 points for the losing side, Ante Zizic (left knee) remained on the sidelines. LeBron James led the Los Angeles Lakers to their 121-113 victory over the San Antonio Spurs with 42 points. 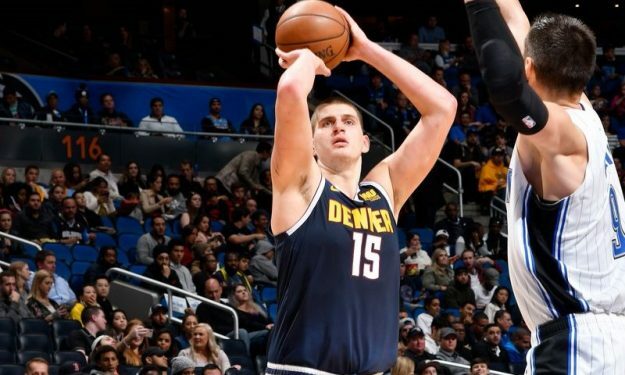 His Ukrainian teammate Sviatoslav Mykhailiuk posted four points, while Davis Bertans, Jakob Poeltl and Marco Belinelli scored a total of 17 points for the losing side. Pau Gasol (right foot) remained out.